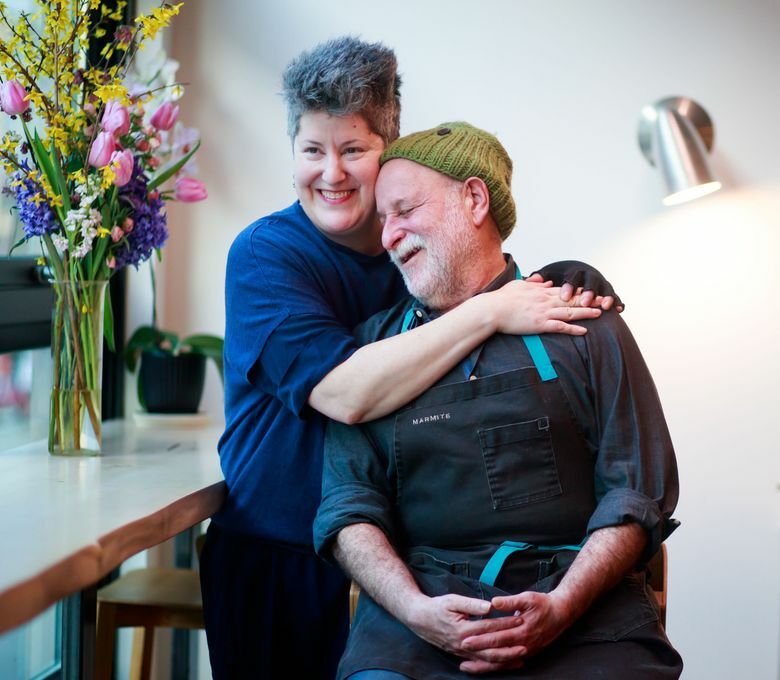 The sweet and funny ways that five Seattle-area couples make working together work in the stressful realm of restaurants. Working in restaurants means extreme hours, broken dishwashers, no-show staff. It also means perfect plates, dining-room proposals, and the satisfaction of making a life out of feeding people well. For a couple to do it together seems so nutty, it just might work — and these five pairs make it work beautifully. With Bruce’s restaurant Marmite and Sara’s bakery Amandine, and, now, her brand-new creperie Petite Galette, the Naftalys keep very, very busy. Luckily, all their places are in the same space, Chophouse Row. How they met: Bruce and Sara’s first meeting was both sweet-hearted and good-hearted — his friends brought her to his restaurant, Le Gourmand, for the very first Dining Out for Life fundraising night in March 1998. The ruse of the setup: She’d just moved here, so maybe he could advise her on where to look for work as a chef. The answer turned out to be … Le Gourmand, for a decade-plus. April is the general manager of downtown’s Loulay (with the 5th Floor in San Francisco, Cascadia and Earth & Ocean also on her résumé). 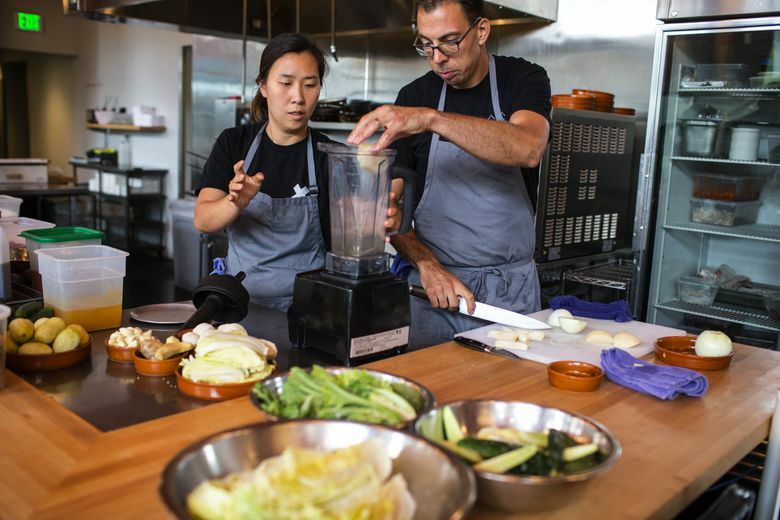 Becky, who has cooked at The Herbfarm, La Medusa and La Spiga, is a private chef, cooking instructor and author (including of the upcoming “How to Taste”). 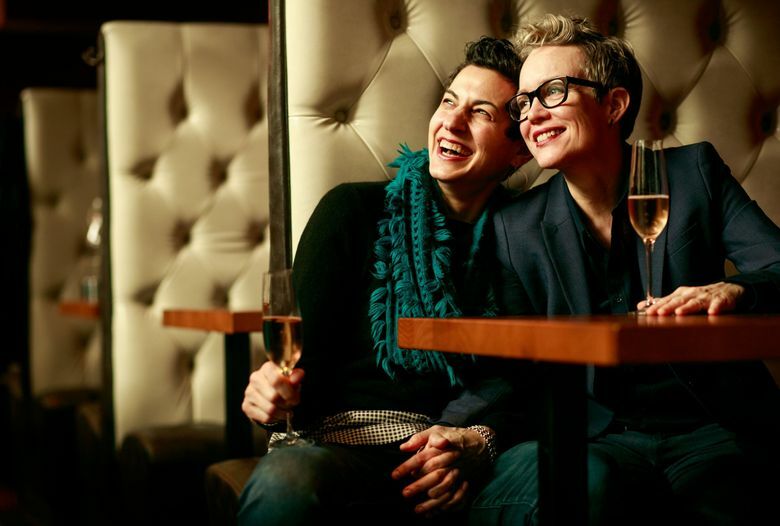 How they met: April had seen Becky around and “wistfully admired her from afar for a long time.” Then one fateful night at Chop Suey, April offered to buy Becky a drink. The music was loud. “I’ll have what you’re having,” Becky said, “and she said, ‘Grtongriton.’ ” After shouting “WHAT? !” and still not understanding, Becky played it cool, saying, “Oh, I’ve never heard of that drink before.” April looked “half-mystified, half-disappointed,” which Becky only understood when she took a sip of a good ol’ gin and tonic. “It was an awkward start,” Becky says. April concurs. Somehow they ended up married anyway. All-time-best-date restaurants: They make the most of the rare nights they both have off, heading to a long list of favorites including Artusi, Poppy, Sushi Kappo Tamura, L’Oursin, Mashiko and Altura. Jackie runs Prosser Farm, growing produce for a number of popular Seattle restaurants. Tom is married to Jackie and runs those restaurants. How they met: Jackie worked at Pike & Western Wine Shop. Tom was waiting to take the helm as chef at Cafe Sport, unveiling soon in Pike Place Market. During delays — “gee, that just never happens,” Jackie jokes — Tom hung out at the shop to while away the time … and see Jackie. Jackie told a co-worker she thought Tom was “handsome and funny,” and the co-worker attempted to play Cupid, letting Tom know. 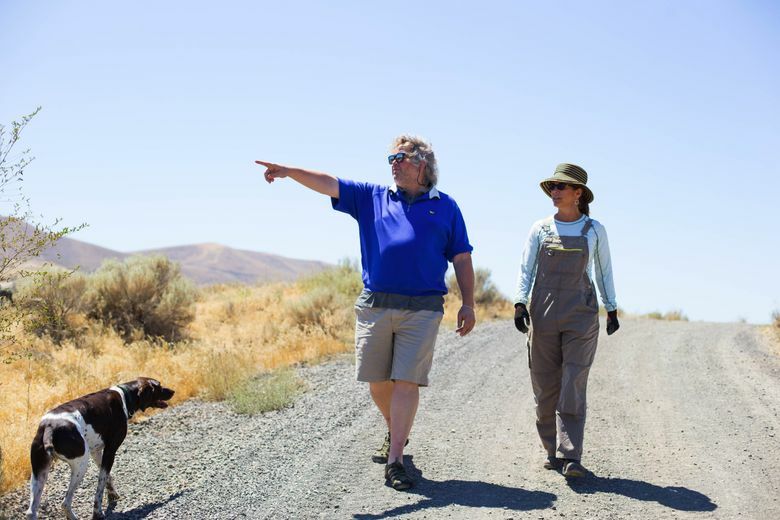 After several weeks of “embarrassed feet-shuffling,” Jackie says, “I finally just asked him out — I’ll never know if he would ever have gotten up the nerve to ask me!” That was 36 years ago. Favorite date-night spots: Jackie and Tom like to go see their ex-coworkers at places like Ma’ono, Lark and Nell’s. And they like to visit “restaurant friends we have made over the years, like Thierry and Kathy at Loulay, Rick and Anne at Wild Ginger, Harry Chan at Tai Tung” and more. 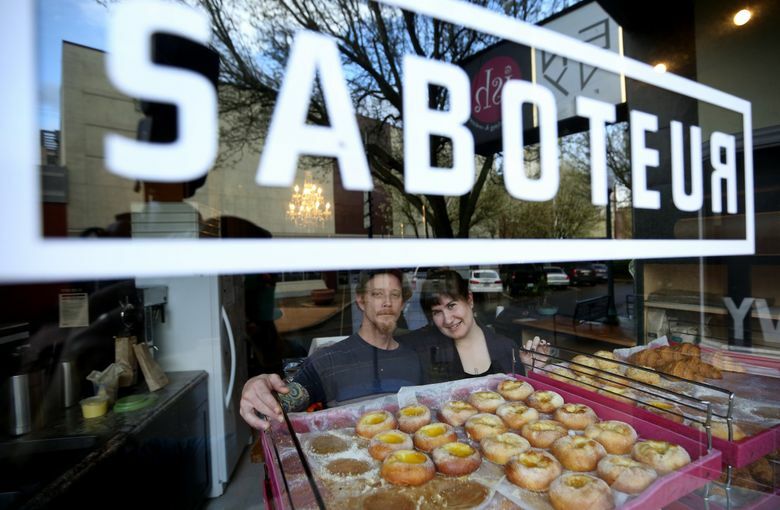 Kate and Matt both worked at a couple of the Bay Area’s best restaurants, he as pastry chef and she on the management side. A couple years back, they traded in that world for running their own place, Saboteur Bakery, in the unlikely location of Bremerton. On working together: “The best part is getting to see her all the time,” Matt says. “The worst is having to see her all the time.” Luckily for Matt, Kate gets his sense of humor: “The best part is we laugh a lot,” she says. The worst is that “you are going to talk about work all the time,” she notes. It seems to be going all right — they just got married. Date night in Bremerton: For a couple with a Michelin-starred past, they like to keep it simple — right now, it’s pinball at the bar Another Castle. Seif and Rachel co-own and co-chef Seattle restaurants Joule, Trove and Revel (Revel, FYI, just moved temporarily to South Lake Union), as well as Revelry in Portland.